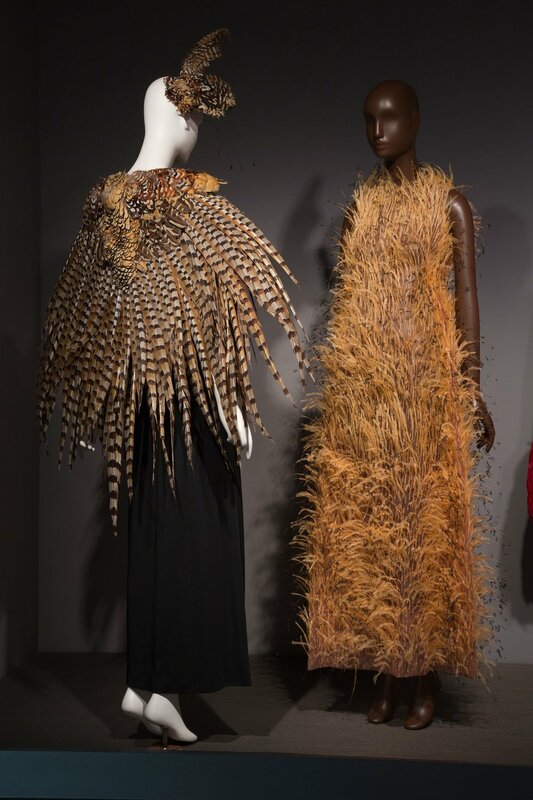 The exhibit “Fashioned from Nature” on view at the V&A explores the complex relationship between fashion and nature from 1600 to present day. Caroline Reboux hat. Pine marten fur and grosgrain ribbon. Paris, c. 1893-7. A holistic approach by the curator reveals some surprising facts and really deepens our understanding of the complex (and at times perverse) relationship between fashion and our natural environment. Bodice and skirt, 1868-1869. 5,000 beetle wings and part of wings were used to decorate this dress. First off, you can blame Louis XIV for creating the fashion cycle. Each year he ordered new silks for the royal wardrobe and the previous “collection” was discarded. Sounds familiar??? The royal court was setting the trends for fashion and the trickle down effect to all levels of income in the population was a huge economic engine. The issue of textile waste was, however, taken care by the belief that being wasteful was against the laws of God and nature. Clothes had a monetary and moral value that went beyond the kudos and privilege fashion could express. Court mantua and petticoat, 1760s. Bodice, 1600-25. Court mantua and petticoat, 1733-40. For ever in fashion, nature has inspired patterns, colors and shapes. The tragedy is in the use of natural materials extracted from animals or the over exploitation of the land. From stuffed animals to fur, pearls, feathers, turtle shell, ivory, whalebone, beetle wings, we have been plundering nature for our own peacock moment. 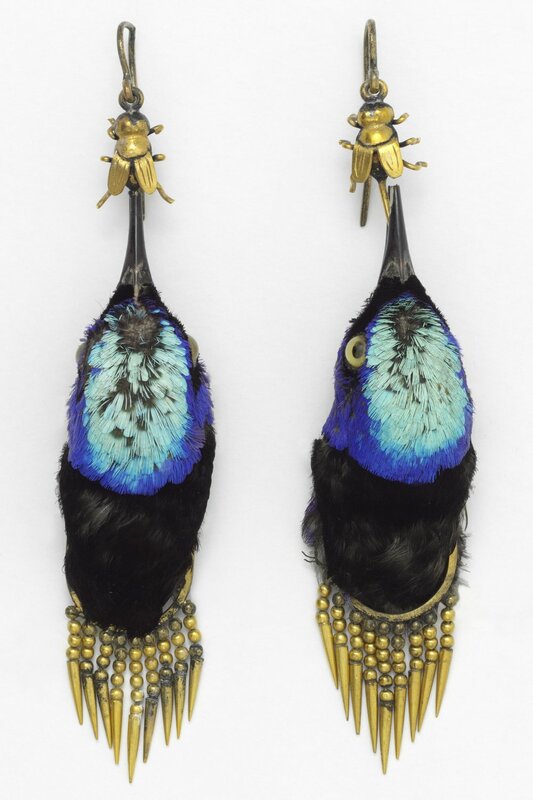 Earrings made from heads of red legged honeycreeper birds. In the early 1800 the negative impact of fashion on the natural world became apparent. Newspapers report concerns about the pollution caused by the textile industry, the destruction of areas of natural beauty and the relationship between humans and animals. to be treated humanely and protected (overhunting of the beavers in Europe was identified as an issue in the 1600). Current awareness of the disastrous effects of the fashion industry on nature (fast fashion in particular) is spurning a new generation of designers, materials and customers. The fashion industry produces 1.9 billion tonnes of waste water per year. If we continue on our current path demand for water by 2030 will outweigh supply. So, should we use water for growing fashion or for drinking? Designer Michelle Lowe-Holder uses heritage crafting techniques and upcycling vintage and end of line ribbons. The use of carved ivory, baleen, tortoise shell elevates objects such as this fan from practical to luxury items. Were used as decoration, jewelry or on accessories such as this clutch. The V&A wants us to think differently about our approach to fashion and how we can learn from the past to make a better future – we are not judged for our choices but educated to make better ones. A powerful message.